Well I drove out to the Cmax to see King Kong last night. It wasn't as good as I was hoping it would be but is was still pretty good. There were a couple of surprisingly shonky visual effects, but all the animation is lovely. That monkey is quite amazing. Normally I'm not a big fan of Naomi Watts, but she was nice in this - she also looks like she's had something to eat, which improves her appearance. Jack Black was pretty much doing a reserved version of his usual silliness, but it was entirely appropriate and I liked him very much. There's some frenzied cutting and handheld camera work which gives me the shits (and a bit of a headache in this film). But really - compared with most of the slop we're handed these days from mainstream studios, it was wonderful. The action was great - in particular I liked the end of the brontosaurus stampede where they all trip over and fall about the place. 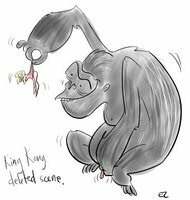 Again - that ape is just astonishing. Some real life going on that is very lovely. 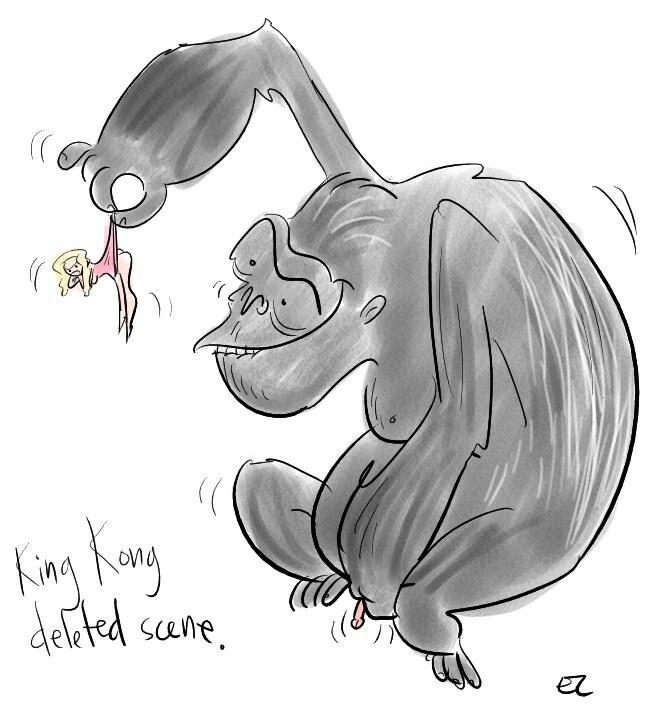 My favourite scene in the whole film involved Kong running rampant looking for the right blonde. interesting work here do u do in art? Ricardo - almost everything on here was done in Painter. THere's also some pen and ink work kicking around. Will that image be on the Kong DVD? Yes - it sure will! That's freakin genius Elliot! Hilarious! Mortco - Nice to see you here! And a new blog - wonderful! aaaarggghh! !...guess which bit of that drawing i spotted last...! Ha! - Cheers Mr Dunn. It is a testament to my skill as an artist that your eye is drawn to the punchline last (cough ahem).